Atmospheric Water Vapor contains the technical proceedings of the International Workshop on Atmospheric Water Vapor held in Vail, Colorado, on September 11-13, 1979. The papers assess the state-of-the-art in measurement, modeling, and application of atmospheric water vapor properties and highlight important problems that require further effort in order to better understand the atmosphere itself as well as the electromagnetic propagation through the atmosphere. 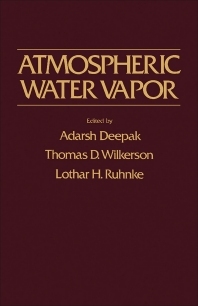 Comprised of 39 chapters, this book begins with a discussion on the optics and spectroscopy of water vapor. Some actual spectra showing the problems specific to the water molecule are described, along with the method used to calculate precise vibration-rotation energy levels and wave functions. Atmospheric infrared transmission measurements in maritime locations are also presented. Subsequent sections explore microwave and millimeter wave phenomena; geoastrophysical applications; and in situ measurements, remote sensing, and meteorology of water vapor. The final chapters deal with the microphysics and atmospheric chemistry of water vapor. This monograph will be of interest to scientists from universities, government agencies, research laboratories, and industry.